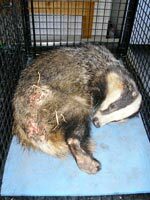 Any live badger casualty should be covered with a blanket or coat (this reduces the stress to the animal and has the effect of calming it thereby reducing the likelihood of escape and/or further injury.) The Hotline should be contacted immediately (day or night) and careful note made of the EXACT location of the casualty. (It is also VERY IMPORTANT that someone stays with the animal until help arrives.) In the event the animal can be returned to the wild, it would need to be returned as close as possible to the original location, in order that it can find it's way 'home'. Experienced members of the group are equipped with cages and graspers and can transport the casualty to a vet for treatment. 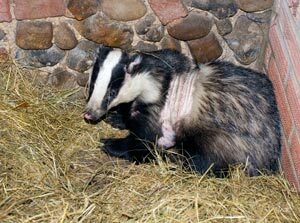 Please do not attempt to transport an uncaged badger in your car - even one that appears to be unconcious. They can recover sufficiently to cause immense problems to the driver and any occupants of the vehicle. The group has a rehabilitation pen where rest and recuperation can take place if necessary, prior to release back into the wild. It is important that any dead badger is dealt with quickly and removed from the location. We welcome reports of dead badgers to our Hotline. 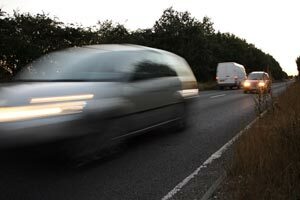 A member will be sent out as soon as possible and they will check for any suspicious injuries which are not consistent with a road traffic accident. 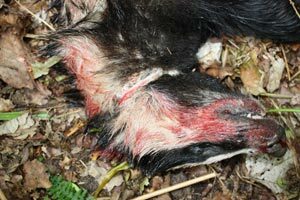 Sometimes badgers which have been snared or killed by some illegal means will be left in the road to look like the result of a road traffic accident. The image on the right is of one such badger found abandoned in the road. The marks from the snare can be quite clearly seen around it's neck. It is especially important during the months of February - May to check for female casualties which may be lactating. A round the clock watch would then be organised in an attempt to rescue any cubs which may have been left motherless. We have been successful with some of these and the cubs are then sent on to Secret World or Wildlife Aid (with a sizeable donation from the group), where they can be grouped together with other cubs and released later in the year to establish their own clan. 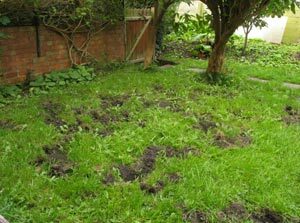 Many people are delighted and welcome badgers when they visit their gardens, but on occasions, lawns and plants can be damaged to the disappointment and annoyance of the gardener. Badgers and their setts are protected by law, but there are lawful actions that can be taken to resolve, or at least minimise the problems. Usually badgers visit gardens in search of food. They are creatures of habit, living in a social group or family which occupies a territory. This may incude your garden and depending on where you live could also include many of your neighbours' gardens and surrounding fields. The size of territories varies considerably. Badgers are normally nocturnal, so often visit gardens unseen, unless the sett is nearby when they may visit in the early evening. 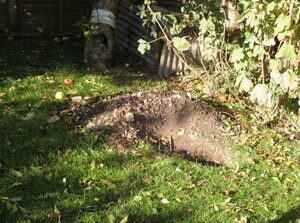 Badgers tend to follow the same route within their territory so the entry point to your garden should be easy to find. On occasions an injured badger may seek refuge in a garden and hide away in an outbuilding or under a shed, or if a badger starts to excavate a sett in your garden, seek immediate advice (ie ring the Hotline). Badgers are omnivoruous and will eat many things. Mostly they will look for earthworms and insect larvae, but they will also eat flower bulbs, fruit and vegetables. They are often attracted to food put out for the birds, especially peanuts. The most obvious sign of badgers feeding is when they dig small pits in lawns to remove food such as cockchafer, cutworm and cranefly larvae. In dry frosty weather, badgers are unable to get at their normal earthworm and insect larvae food. Putting out food and water at these times specifically for the badgers may distract them from the other food available like your fruit and vegetables! They will readily eat raw unsalted peanuts, most soft fruits, bread with honey/jam/treacle (small amounts) and meat scraps. However, food placement may encourage the badgers to visit more frequently, which could make matters worse if they are causing a nuisance, or may increase the potential for nuisance. It is recommended that you always seek advice before considering any action. The NEEBG has lots of experience of dealing with badgers in gardens and will provide free advice. The legislation in place to protect badgers and their setts needs to be clearly understood to avoid illegal but well-intentioned action. You could, for example simply block a badger access to your garden, but if this prevented a badger from getting to or from its sett, it could be an offence. It is possible to construct a fence that will deter badger entry. Badgers are strong and persistent animals that can easily break through or dig under a weak or poorly constructed fence. They can climb and squeeze through quite small gaps. A strong wood fence with chain link type fencing attached and extended below ground level or a chain link type fence with the bottom edge extended and buried is recommended. An alternative is a stone or brick wall with a suitable foundation. Electric fencing, either battery or transformed mains can be an effective deterrent. Such fencing need to be installed with wires at the appropriate height and will require periodic maintenance, but it can be fitted unobtrusively. There are NO approved chemical deterrents available for use with badgers. There are claims that male human urine, human hair clippings and even lion dung spread on the garden may act as a deterrent, but none of these are recommended. The demands of Man for more houses and bigger and better roads is having a huge impact on our wildlife. 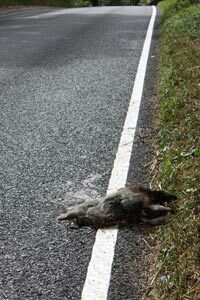 As the countryside and wildlife habitats diminish there are inevitable increases in road casualties and a sometimes unwelcome resultant surge in urban wildlife. Planning authorities are required to take account of protected species and habitat conservation when they consider planning applications. In the case of a large development or the building of new roads an ecological assessment should take place to ensure the needs of the species are met. Work may then take place under licence from Natural England. We, at NEEBG are often consulted and are happy to be involved at an early stage by undertaking preliminary survey work to establish the whereabouts of any badger setts affected. We can then work with planners or developers to ensure mitigation is in place. We are always pleased to co-operate with the construction of artificial setts as alternative accomodation for the badgers, monitor their movements and help ensure they move as swiftly as possible . 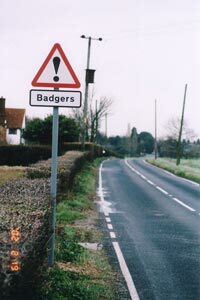 With the construction of new roads, badger tunnels - together with roadside fencing can help to alleviate badger road casualties and again we are pleased to offer advice and/or help in establishing suitable sites.